New research measuring the importance of religion in 109 countries spanning the entire 20th century has reignited an age-old debate around the link between secularisation and economic growth. The study, published in Science Advances, has shown that a decline in religion influences a country's future economic prosperity. While it is well documented that rich countries tend to be secular whilst poor countries tend to be religious, it is still unclear if secularisation causes wealth or the other way around? The subject has long been debated by classic scholars of social science including French sociologist Emile Durkheim, who claimed that religion fades away once economic development has satisfied our material needs, whereas German sociologist Max Weber, argued that changes in religion drive economic productivity. The debate continues to this day. Researchers from the Universities of Bristol (UK) and Tennessee (US) used data from birth cohorts from the World Values Survey to get a measure of the importance of religion spanning the entire 20th century (1900 to 2000). The findings revealed that secularisation precedes economic development and not the other way around. Although this does not demonstrate a causal pathway, it does rule out the reverse. Furthermore, the findings show that secularisation only predicts future economic development when it is accompanied by a respect and tolerance for individual rights. Countries where abortion, divorce and homosexuality are tolerated have a greater chance of future economic prosperity. 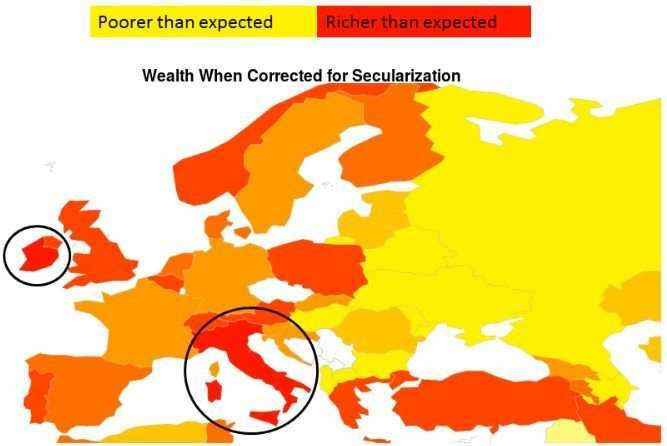 Damian Ruck, the study's lead researcher in the University of Bristol Medical School (Population Health Sciences), said: "Our findings show that secularisation precedes economic development and not the other way around. However, we suspect the relationship is not directly causal. We noticed that secularisation only leads to economic development when it is accompanied by a greater respect for individual rights. "Very often secularisation is indeed accompanied by a greater tolerance of homosexuality, abortion, divorce etc. But that isn't to say that religious countries can't become prosperous. Religious institutions need to find their own way of modernising and respecting the rights of individuals." 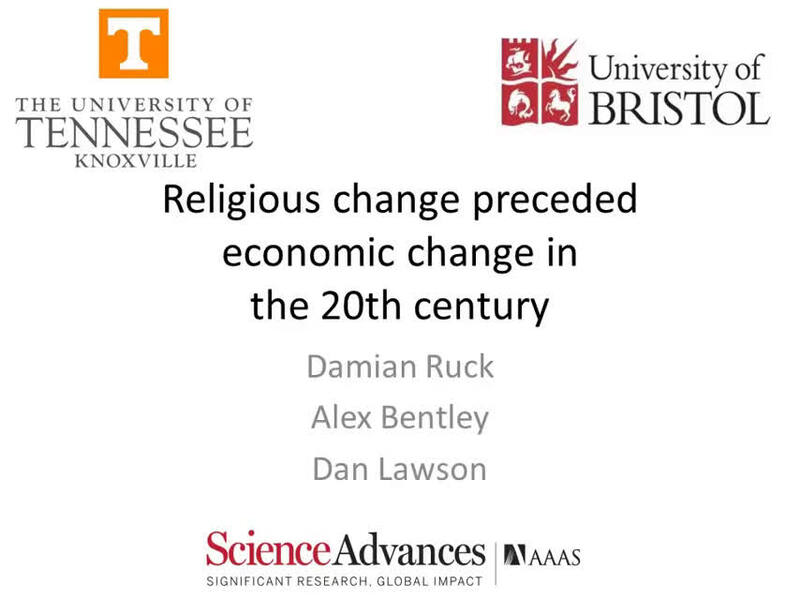 Alex Bentley from the University of Tennessee, added: "Over the course of the 20th century, changes in importance of religious practices appear to have predicted changes in GDP across the world. This doesn't necessarily mean that secularization caused economic development, since both changes could have been caused by some third factor with different time lags, but at least we can rule out economic growth as the cause of secularization in the past." Does religion protect against suicide? Assuming they are correct, enlightenment (including individual rights) leads to prosperity, while secularization - realizing the nature of nature - is correlated with it. Well stated. Good secularisation lends itself to a better social structure, and thus better economic and social out comes. Consider the situation from a purely mathematical perspective. A nation's productivity and thus economic development is the sum of each individuals economic activity. Respect for individuals and rights tends to increase the percentage of fully participating and productive individuals in any society, increasing overall wealth and economic activity. Misery may love company but it makes everyone poor. Secular government is the relinquishment of a government's monopoly on society's social norm. The liberalisation of social morality meant an individual is now free to break the tradition and adopt a different behaviour such as homosexuality, performing taboos or adopt controversial self-images. However this doesn't mean the government is completely liberal as they can still be conservative about individual morality such as theft, murder, and trespassing. When you open up the country to a different social morality you enhance migration into the country, and migration has the effect of vitalising the economy. For example, take a Muslim immigrant as an example, as a Muslim he/she believe in Polygamy practice but for many western country this practice is illegal, this is an example of non-liberal/non-secular marriage law. A lot of government mistaken "secular" as forcing a specific religious minority to behave in a modern manner. This is a mistake, you can't tell people to wear a suits or think godless, that is not liberal. Religions drain enormous resources from economies. Consider the tithe alone takes 10% out of consumer pockets. Religions are tax-free and dont contribute to support of govt institutions. Most importantly religions fuels overpopulation which drains money from economies in many ways, most directly by increasing inflation. More mouths chasing fewer goods. Religion is nothing more and nothing less than a parasite. OF COURSE it retards growth.